Music has a special relationship with people, even if they’re not always consciously aware of it. Recent studies have shown that music can affect a person’s mood (for better or worse), can be used therapeutically, and may even help with brain damage and memory loss. Singing has just as good an effect. Of course, Eminem already knew that music can alter moods and talk to you, but can it help your plants grow too? (Yes.) And do we really need all of these studies (and Eminem) to explain that music deeply affects us (and plant growth)? I got to thinking about this yesterday morning, when my wife told me that Chris Cornell died. And then the Facebook and Twitter posts made me think some more. When a musician dies, it can seem like the entire world suddenly likes that person. But I don’t think that’s the case. When I listen to music, I make connections; I think we all do. There are songs I associate with people – like hearing Chris Cornell makes me think of my wife (more on that later). But there are also songs associated with places and moments in life. Sometimes, the lyrics in a song might hit us in a certain way, creating a connection that we hold on to. It’s a tribute to the talents of these artists that the music they create has such a powerful hold on our lives. Country music artist Kenny Chesney sings a song called “I Go Back” which captures this idea. He sings that “Jack and Diane” takes him back to his first love, “Keep on Rockin’ Me Baby” takes him back to his college days, and “Only the Good Die Young” takes him back to the death of a friend. To you and me, these may be songs with little or no meaning, and John Mellencamp, Steve Miller, and Billy Joel might not even be on our radar. But in the chorus of that song Chesney sings, “We all have a song that somehow stamped our lives / Takes us to another place and time,” – I believe we all can relate to those lyrics. Take a moment and think of those songs that have that pull on you. I know for me, when Meatloaf dies, I’ll play “Bat Out of Hell” and think of my father popping the record on and cleaning the house while singing along. And when our daughter was born, Tim McGraw’s “My Little Girl,” a song that was just there before, somehow became a song that choked me up. When artists die, they may not be our favorites, and we may not like any of their music in particular, but they may have that one song or lyric that somehow stamped our lives or took us to another place and time. Listening to that song is a way to get those memories back, or conjure up feelings that we once felt. Last year was a prime example of this phenomenon. More than one end-of-the-year headline called 2016 the year the music died. And I saw no shortage of tributes. In order, we lost David Bowie, then a week later Glenn Frey. A few weeks later, Moe White died. The month of March gave us a break, but April took Merle Haggard and Prince. Death came back at the end of the year for Leonard Cohen, Leon Russell, and George Michael. (And let’s not forget that these came on the heels of the deaths of Scott Weiland and Natalie Cole in December 2015.) We lost some really big names in music over the course of a year, and the songs written, played, and/or sang by these women and men touched many lives. I think it’s liberating, or cleansing, or thought-provoking, or sometimes even painful, to reach back and say this artist, or this song, or these specific lyrics touched my life in a way that thinking about them and hearing the music brings those memories and feelings flooding back. And so I return to Chris Cornell. I’m not a big Cornell fan (although I did like Audioslave’s first album), but I had memories associated with him, and these came to me upon hearing the news. My wife liked him – his voice and his looks. 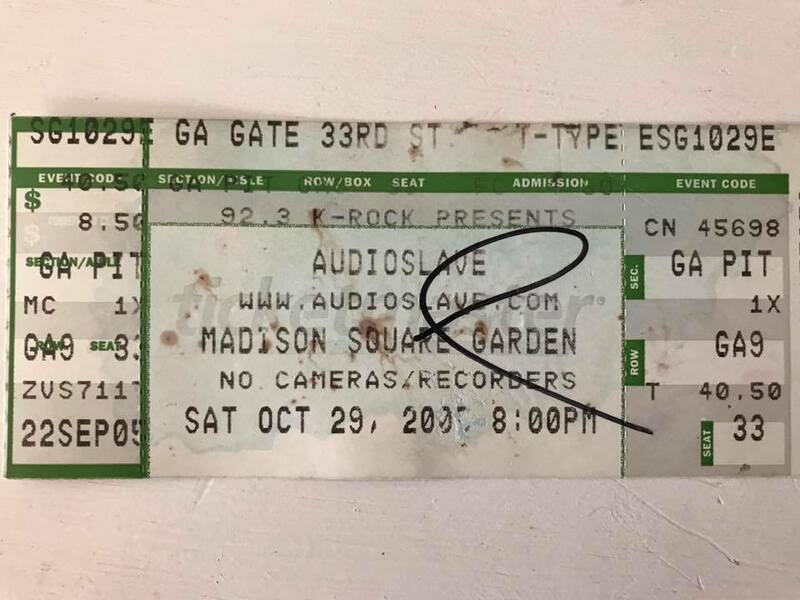 Only a few months after we met, we went to an Audioslave concert at MSG. We had floor tickets and got there early enough to stand at the stage. Despite the possibility of violent “dancing” she wanted to be close. Just before we escaped the moshers, she swore Chris Cornell looked at her and smiled. I didn’t think so, but she insisted, and I liked her, so I went with it. I was more interested in watching Tom Morello shred on his guitar anyway, so it could have happened and I missed it. Two years later, while in Paris on our honeymoon, my wife insisted on visiting Cornell’s restaurant. Being that I still liked her, I went along (it was closed, but she got a picture outside). So when I played “Be Yourself” and “I Am the Highway” yesterday morning, it wasn’t because I loved Cornell or even those particular songs; it was because hearing his voice brought me back to those moments early in my relationship with my wife that, consciously or not, stamped my life. Photo taken by the author’s wife.